I arrived at my second Chefugee cooking class at El Gabinete de Historia Natural near Puerta del Sol and was surprised to be welcomed into a beautiful old history museum. The space, which has been reimagined as a center for community events, is filled with ancient relics, pottery from all over the world, and even the mounted skull from some large, horned mammal. I was greeted warmly at the door and ushered into a large, ornately decorated room near the kitchen, where I sat and took in my surroundings as the other students appeared. We were soon introduced to Valentín, the Venezuelan chef and mastermind behind the class. I watched his eyes light up as he described the food he grew up eating, sharing anecdotes and favorite memories associated with each dish. I recognized the enthusiasm in his voice; I become animated in the same way when talking about the history, meaning, and cultural significance of the food I love. I was amongst friends. The room laughed and I smiled through my awkwardness. In short, the answer was no, I’d never had Venezuelan food before. 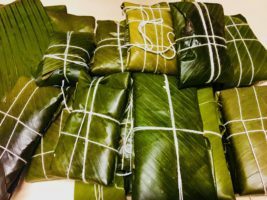 And to me, it was an incredible privilege that Valentín’s class through Chefugee was my first introduction to the country’s cuisine. Chefugee, a branch of the organization Madrid For Refugees, is an initiative that gives refugee chefs the opportunity to earn money while raising awareness of their experiences through my all-time favorite medium: food. Chefs can prepare meals for pop-up dinners or lead cooking classes to showcase their favorite dishes from home. In April, I jumped at the chance to cook alongside and learn from a Syrian chef offering a class (full disclosure: when it comes to cooking, I need all the help I can get). It was a truly unforgettable experience, so when I saw the announcement for Valentín’s class, I didn’t hesitate to enroll. 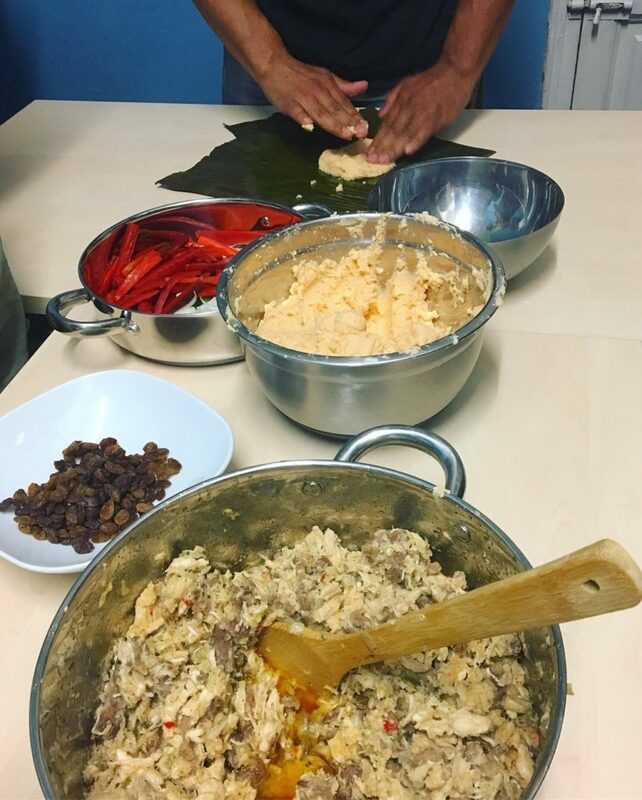 Today, we were learning how to make hallacas and pan de jamón. 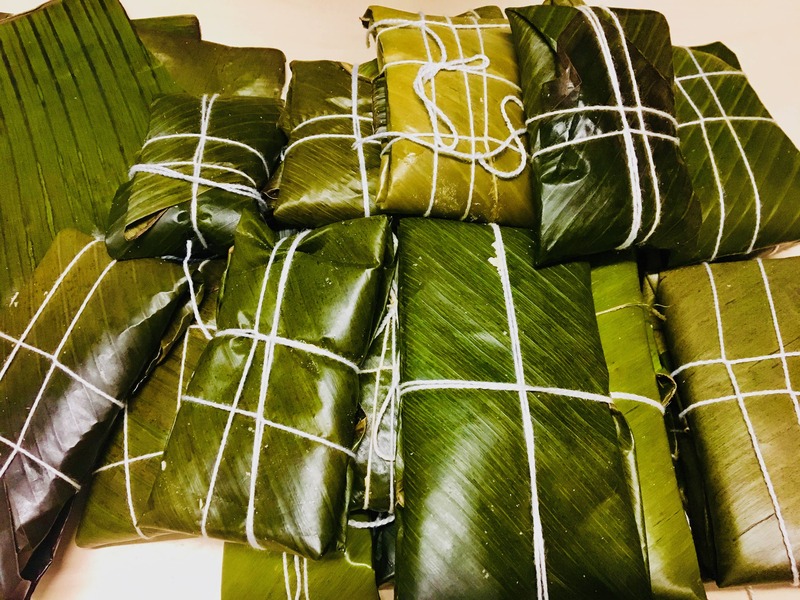 Hallacas are, in fact, cousins to Mexican tamales in the sense that they’re made with masa (dough from corn flour) and guiso (stew) which are wrapped in plantain leaves (rather than corn husks for tamales) and boiled. The ingredients of the guiso can vary greatly, and Valentín reminded us often that we can be as creative as we want with the fillings. 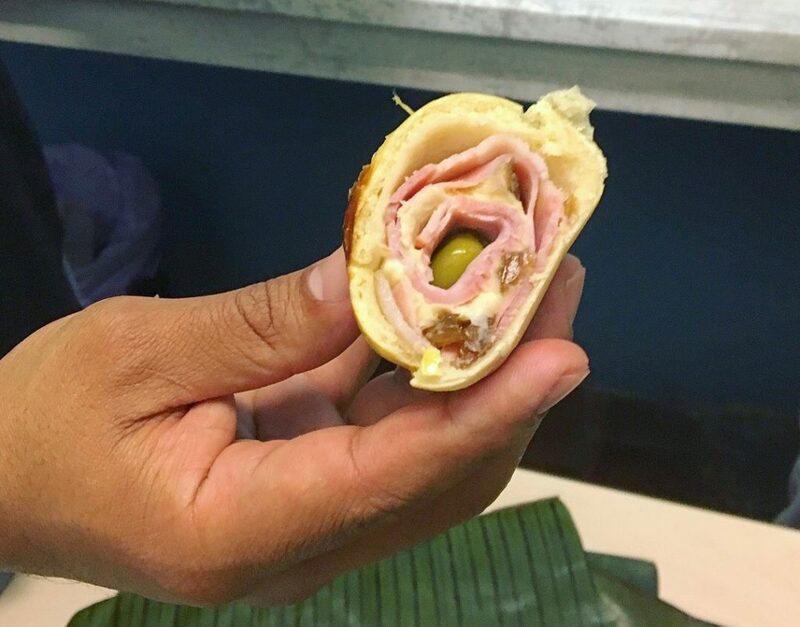 The pan de jamón, a sentimental favorite of Valentín’s because it’s traditionally served at Christmas in Venezuela, we made by rolling ham, bacon, olives, and raisins in a yeasty homemade dough. The kitchen soon filled with the pleasant smell of the guiso mixed with baking bread and bacon. It was easy to see that Valentín was a talented chef. With 15 years of experience in the kitchen, he was especially skillful at improvising and adapting to taste. He was also an excellent teacher. In fact, he taught for a living before coming to Spain and it certainly showed. Apart from giving clear instructions (often using gestures to maneuver around the language barrier with me), he wanted us to learn more deeply about this food and where it comes from. He talked briefly about the situation in Venezuela, about how difficult it is to send money and medicine back home to family still living there. When the arepa question came up again (are they Venezuelan or Colombian? ), Valentín shrugged. The answer: both, or neither, depending on how you look at it. Arepas and hallacas both come from the indigenous communities living in this region of South America. The food we were making pre-dates the two countries by thousands of years. More than a great chef and teacher, Valentín was an entertainer. His initial energy didn’t let up throughout the whole class, and he often made the kitchen erupt with laughter. At one point, while I was struggling to shred some particularly fatty beef for the guiso, he leaned onto the counter beside me and yelled “más fuerte!” He reached into the bowl, grabbed a handful of the beef, and started ferociously tearing it apart. “Como si fuera el pelo de tu ex-novio!” Like you’re ripping out your ex-boyfriend’s hair. Grateful for the charisma (and the visual), I returned to shredding the meat with slightly more force. 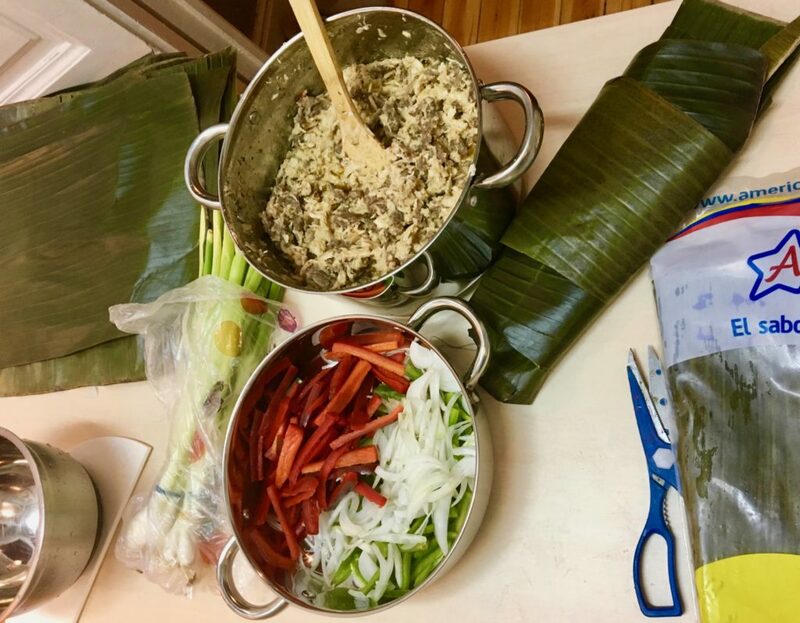 In both classes I’ve taken with Chefugee, the food was beyond compare, the camaraderie in the kitchen was convivial, and the experience overall was invaluable. In both cases, I signed up because I was curious to learn more about the regional dishes and I wanted to support an important and powerful cause. And in both cases, I left feeling like I got so much more out of the class than I gave. It has truly been an honor to meet and eat with these talented chefs.